June 17 2018, we celebrate Father’s Day. Each day I am thankful for my dad. I am forever grateful that he is healthy and actively supporting others in their lives first as an educator in his younger days and now as a friend to his community. This Father’s Day weekend, I hope you'll bring to mind someone who has shaped your life in a positive, beautiful way. Reach out to them. Write an email, a letter or a post about it and share a Facebook note. Let your note to them be up-lifting. Time waits for no one. Brings to mind, 1997, September. My dad was hospitalised and being prepared for his heart surgery. I had for the first time thoughts about life, death, meaning and purpose, regrets, joy, what makes life worth living and what I want to leave behind. My father had a true knack for making the people around him feel truly listened to and appreciated. I am thankful today in 2018, he is well, active and sharing his gems of wisdom with his grandsons. 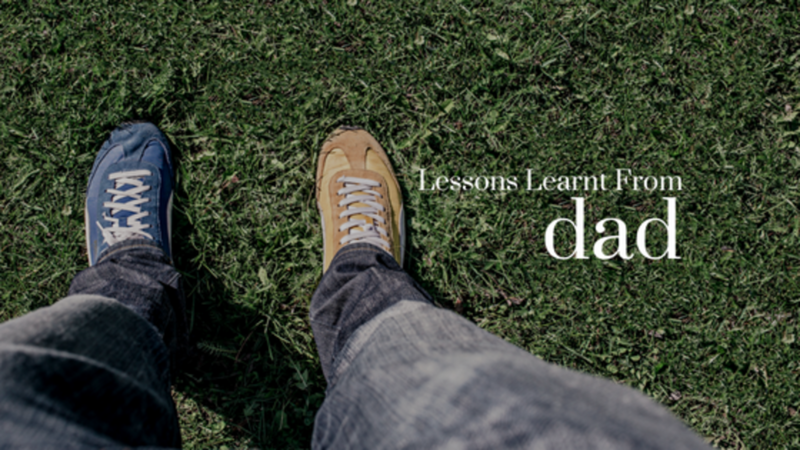 On this Father’s Day weekend, I bring to mind several vitally important life lessons I learned from being Dad’s daughter, and from observing how he lived his life, even throughout all his quiet observations and attending to the needs of others. These two lessons stood out for me and the cornerstone of many of the parameters of my decision making. Through each choice he made — in his words, deeds, and beliefs — Dad lived each day accomodating others in his younger days. But as he grew older. I suppose he would say now that he wants to live without regrets. He’s become more assertive and sharing more freely his thoughts and ideas. I think that he knows he always did his best, but was not able to. Reflecting on this, I am inspired to not waste another moment to accommodate, tolerate but to live fully, vibrantly with me creatively expressed. I live each day so that I can lay my head on my pillow and have no regrets. How to do that? I try to always do my very best and let my bold best self show up. In that process, I sometimes fall short - impatient, short-fused, biting off too much, I need to forgive myself when I fall down brush off the dust and tomorrow is a brand new day again. I still work hard but is from a place of self-love compassion and connectedness. Deeper work in and on myself. I can’t control or manage others put I can for me. In our world today we often see cruelty, snarkiness, judgment, hatred, divisiveness and negativity creep into every moment of our lives. We are bombarded by fear, pain and suffering. But Dad had focus on gentleness, kindness, love and compassion when sometimes it costs him his relationships. My work focuses on shining the light on people to change their and our world for the better, making their impact in a positive, compassionate way for all to live a more excellent life. You might have heard of the phrase “What you focus on truly expands and grows.” Hence when you focus on problesm, they will multiply. If you focus on opportunities, you see possibilities. You can indeed shape your experience of happiness, joy and fulfillment with committed, conscious action, inspite of your context by focusing of being kind. Dad also paved the way for me to understand that our words can be used aa sweet sound for the soul OR a bomb of mass destruction. I try every day to choose the former. We can’t choose how people draw their conclusion and talk about things which they feel is important/help (sometimes called gossips without checking their facts), we can choose how we respond for our sake more than for them. Let your words be kind. This Father’s Day weekend, I hope you'll bring to mind someone who has shaped your life in a positive, beautiful way. Reach out to them. Write an email, a letter or a post about it and share a Facebook note. Let your note to those who made a positive impact on you be up-lifting. Happy Father’s Day to you and yours.